May 26, 2010 - The National Air Traffic Controllers Association (NATCA) has awarded former Federal Aviation Administrator Jane Garvey with its Sentinel of Safety Award, in honor of her dedication to aviation. The award is the highest honor for those outside of the organization who have displayed outstanding achievements in the advancement of aviation safety. Dedicated to building a collaborative partnership with NATCA, Garvey, who served as the 14th FAA Administrator, was both the first female Administrator and the first to serve a five-year term. The Sentinel of Safety award puts a special emphasis on those who have gone above and beyond to preserve and improve the National Airspace System. “I can think of no better way to describe the leadership of Jane Garvey, one of NATCA’s strongest allies, than extraordinary, aggressive and courageous,” said NATCA President Paul Rinaldi. Dedicating her term as Administrator to modernization, more modernization efforts took place in her tenure than in the previous 20 years. During her term, Garvey unveiled the FAA’s Operational Evolution Plan – designed to serve as the backbone for large-scale modernization in the system. She even oversaw the Y2K transition, calming public fears by taking a flight on New Year’s Eve. Prior to her time at the FAA, Garvey served as the director at Boston’s Logan Airport, followed by tenures as Acting Administrator and Deputy Administrator for the Federal Highway Administration. NATCA has worked with Garvey in recent years when she served as a judge for the first two years of the Archie League Medal of Safety awards and through her service last year on the three-person mediation and arbitration panel overseeing the negotiations on NATCA’s new bargaining agreement with the FAA. “Jane Garvey was one of the finest FAA Administrators and public servants this country has ever seen. I’m proud to call her one of NATCA’s most steadfast supporters and a friend,” said Rinaldi. 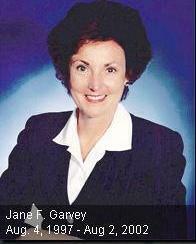 Jane Garvey was head of the U.S. Federal Aviation Administration from 1997 to 2002. Garvey earned her B.A. from Mount Saint Mary's College (a Catholic women's college in Hooksett, New Hampshire which closed in 1978 and her M.A. from Mount Holyoke College and has been awarded several honorary degrees. She was appointed by President Bill Clinton and holds several "firsts" for an FAA Administrator: she was the first Administrator appointed to a 5-year term, the first female Administrator, and the first Administrator who was not a licensed pilot. She had previously worked as a teacher, highway safety administrator, and the director of Logan International Airport.